THE substance of the exposition in the following pages was first delivered in the form of lectures, at which time shorthand notes were taken which have been revised since, and considerably altered by the writer. Much matter too has been eliminated to reduce the volume, which might have been too large, and thus wearisome to many readers. It is hoped that enough has been retained to give a clear and succinct outline of the teaching of the book of Daniel. By referring from time to time to the chart accompanying the book, the lectures will be considerably simplified. 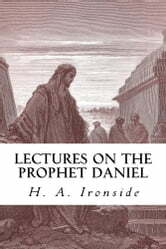 Critical questions such as authenticity and authorship have not been gone into here, though the present writer has carefully examined practically all that has been urged against receiving this portion of the Holy Scriptures as being in very deed a part of the inspired word of God. If any reader has doubts or difficulties on these lines he is referred to the erudite and able expositions and examinations of W. Kelly, Sir Robert Anderson and Dr. Pusey. With the prayer that God may be pleased to use this little book to stir up His own people to more devotion to Himself, a more ardent longing for the coming of our Lord Jesus Christ and our gathering together unto Him, and to the arousing of any who are still in their sins, these lectures are committed to Him who alone can apply them to heart and conscience.